Stir the soup, water, rice, onion powder, black pepper and vegetables in an 11 x 7 x 2- inch baking dish. Bake for 50 minutes or until the chicken is cooked through and the rice is tender. Remove from oven. *Campbell's® Condensed Cream of Chicken Soup in either the Regular, 98% Fat Free or Healthy Request® variety may be used in this recipe. 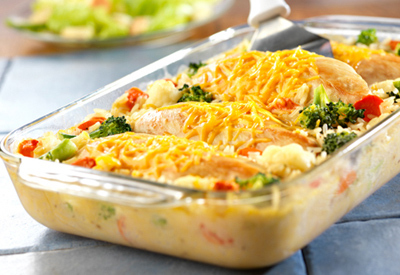 We develop our recipes using a 4- to 5- ounce skinless, boneless chicken breast half per serving. However, there are a range of sizes available in store, from the butcher counter to the meat case and the freezer section. Use whichever you prefer - just follow the recipe as written above for the best result. If you're using larger chicken breasts, a little longer cooking time may be required.